Two post entries in one day! Perhaps I should explain a little more. Most of the miniatures I will be posting up here have already been built and have been hidden away from the world in my case because I've been too embarrassed to show them. This new project, titled Grime Lights, is something new and a little different. For the last few years I've been lurking on Ammobunker's INQ28 section, reading with interest how others go about constructing figures and warbands, choosing themes and paint schemes, but I've been too shy to contribute or comment. 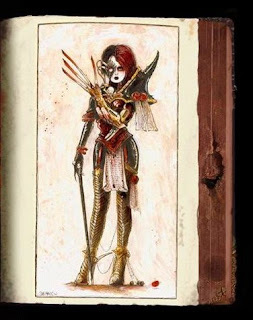 Anyway, for 2016, they're holding a year long project competition around building a member of a retinue for each month with the first being the theme of The First Amongst Equals, representing the 'leader' archetype. Now I will be attempting to join in with this, but I doubt I will post them on the Ammobunker forum itself (mostly because I'm still nervous about coming out of my shell), but I will show the progress here. For Grime Lights I will not only be building the miniatures for the competition, but also designing a world around them. For this 'first amongst equals' I have taken a leaf from this anime series I've been watching recently, Noragami, and making an Exemplar who will be the head of a series of other inquisition agents, serfs and servants, working under a powerful Inquisitor. Her name came from the Japanese translations of 'January', which will be a running theme for the other members (so I will be using a language beginning with 'F' for my February entry, 'M' for March and so on). Exemplar Tsuki Shōgatsu will be base on another John Blanche sketch from The Emperor's Will artwork book. My parts for her arrived this morning, so I will reveal her completed form when she is finished later this month.